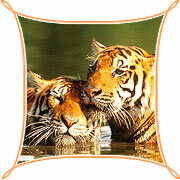 Corbett National Park has captured the imagination of many with its diverse wildlife and breathtaking landscapes. The natural uniqueness of the area was recognised long ago and so in 1936 Corbett attained the distinction as the first national park to be established in mainland Asia. Corbett isn't just about Nature. It is also a rich treasure of history and cultural heritage. The park has a long tradition of conservation. The fact that it is the oldest National Park of the Asia and India's first Tiger Reserve itself symbolises that Corbett is a pioneer in efforts at preserving our natural heritage. Corbett National Park lies in two districts - Nainital and Pauri - in the hill state of Uttaranchal in northern India. It covers an area of 521 sq. km and together with the neighbouring Sonanadi Wildlife Sanctuary and Reserve Forest areas, forms the Corbett Tiger Reserve over 1288 sq. km. Corbett National Park is characteristic of the Himalayan mountain system. Corbett's northern areas are lined by the Lesser Himalayan chain, which extends from Pakistan, through Jammu and Kashmir, Himachal, Uttaranchal, Nepal, Sikkim, Bhutan, and to Arunachal. The Lesser Himalayas are quite high, with an average altitude of 1800 m and are made up of crystalline rocks. The vegetation includes cold-climate tree species like pine, oak, and rhododendron. The Forest Rest House at Kanda at 1300 m is the highest point in the Park and is representative of the Lesser Himalayas.